Although mental health awareness has made so much progress in the last few years, sadly their still remains both a stigma and misunderstanding towards it. Unfortunately, the stigma can seem so much worse among males due to how some people still have preconceptions about how men should be seen as “strong” and therefore not display too much emotion in fear of being stigmatised. So here are 5 ways men can find the help and support that they need to prevent them from suffering in silence when trying to avoid the social stigma. Seeing your GP or family doctor is a good first port of call if you have noticed symptoms of mental illness, such as negative thinking, panic attacks or a general low mood, amongst others. Unfortunately, this is the stage that most often men find the most challenging. It remains hard for many men to admit they have a mental health problem. But realising that your GP will be used to this problem and will not judge you can help with the fear. Your GP can offer support themselves, but should also go through options that you have to find treatment, such as counselling, medication and/or group support. This can be just as terrifying – if not more so – for men as seeing their GP! But after the first couple of sessions the vast majority of people find counselling to be of fantastic benefit and will gradually learn to even enjoy counselling sessions. It’s important to remember that what you say to your counsellor remains strictly-confidential, and remember that they have probably heard your problems numerous times before in different patients. So you have nothing to fear! If you are a man and feel too self-conscious or anxious to book a session, you could get a family member or your GP to book the appointment for you. But probably the most important advice for men is to give the counselling a chance before rejecting it. This usually means giving it 3 or 4 sessions before deciding if it is helpful or not. If it really isn’t helping then you can re-visit your GP and they can suggest other treatments. 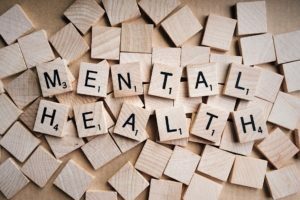 More and more places of work are offering support for employees with mental health problem, as it is realised that many mental health problems caused by work are on the increase, especially for men between 41-59 years of age. It is worth asking your Human Resources team at work for support, since most companies now dedicate a set amount of money towards mental health support. It has the added bonus of providing treatment for free (paid for by the company) and being fully-confidential by law. If you have a very close friend that you absolutely trust, it is a good idea to confide in them with the understanding that what you discuss is strictly confidential. Perhaps you are even lucky enough to have a good friend that suffers or has suffered from a mental health problem. But regardless, having a friend who can listen to you and offer support when you are at your lowest is an extremely valuable asset. Just remember that it is a two-way street, so even if you feel you are too troubled to ask how they are and listen to some of their problems you should still do it as much as you can anyway. They will really appreciate it, and you will often benefit too by getting the conversation steered away and centred from how bad you feel!Many men seem to prefer discussing their problems with female friends because they see females as being much more sensitive and easily to talk about powerful emotions with. But although this is a hotly contested view of women, there is absolutely nothing wrong with it if you feel you can talk easier with a female friend. Some men will even find it difficult to talk to their loved ones in their family about mental health problems they are suffering with, because of the “bread-winner” pre-defined gender roles that some men (and women) still cling onto. In this case, it pays to remember that times have changed since these views were held by society! As a man you can express powerful emotions and no one who really cares about you will judge you negatively for it. So, confide in your close family members if you have a good relationship with them. They may need support for themselves when helping you, and luckily many counsellors now specialise in support for family members who are dealing with their husband or boyfriend’s mental health problems. So as a man finding support these days for a mental health problem is so much easier than it was even 15 years ago. You will find support in most the areas of your life, and slowly but surely you will realise that it’s perfectly okay expressing strong emotions or crying. You are only human, and getting the help you need will help you develop life skills and habits that will make you are a happier person for the rest of your life. Could Facebook technology replace passwords with photo recognition?